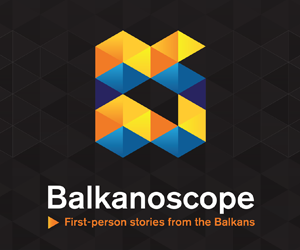 BRUSSELS/BELGRADE/SKOPJE – For a country that tends to join the European Union it is very important to act as a part of the European family, especially when it comes to the foreign policy of the Union. The Foreign, security and defense policy is a negotiating chapter that often qualifies as a political one. It mainly consists of progressive alignment with international legal treaties and political developments in the EU, but also with common foreign policy decisions, stances and measures. 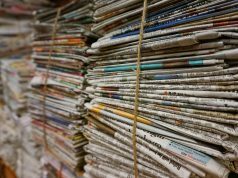 In practice, this means that the countries of the Western Balkans must join the EU’s foreign policy declarations and the measures that arise from them. In January 2019, ISAC fund published an analysis where they compared the foreign policy alignment of Serbia in 2018 with Western Balkan and other countries. The analysis covered 54 European Union declarations of 2018 where they urged candidate countries and potential candidates, as well as countries belonging to the European Economic Area and Eastern Partnership to align themselves with the EU position. In 2018, Serbia aligned itself with 28 joint EU declarations (52%) which represents progress when compared to 2017, when it had just 46% alignment. 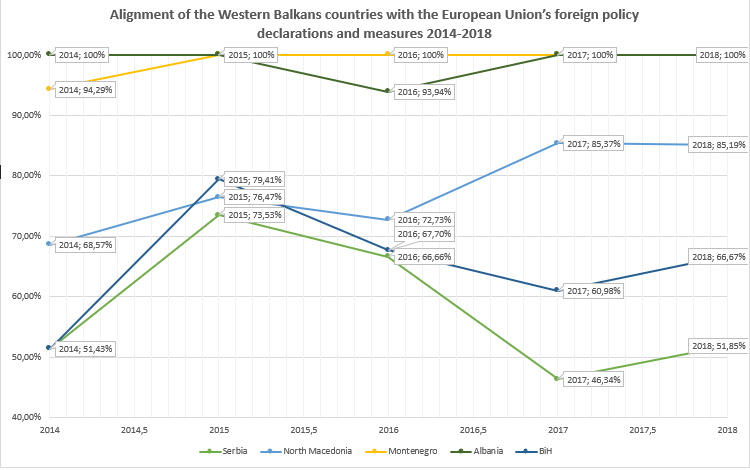 Regarding the other countries of the Western Balkans, Albania and Montenegro have 100% alignment, followed by North Macedonia with 85.19%, then by Bosnia and Herzegovina with 66.67% and, finally, on the last place is Serbia with only 51.85% of compliance. Observing alignment in the last four years, it can be noticed that significant disparity exists in the cases of Serbia and North Macedonia. From 2014 onward, the alignment of North Macedonia has progressively increased, so in 2014 it was about 68% and in 2018 it was 83.19%. On the other hand, Serbia has been constantly in the last place for four years in a row. The country’s alignment in 2014 was 51.43%, and in 2018 it remained relatively the same with 51.85% (slight improvement compared to 2017 when it had 46% compliance, which represents an all-time low). 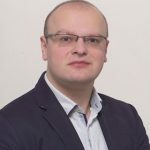 Igor Novaković, Programme Director of ISAC fund and one of the authors of the abovementioned study, thinks that Russian support over the issue of Kosovo is the main reason for the alignment rate of Serbia. “Serbia is not aligning with the CFSP declarations mainly due to the issue of Kosovo, because Russia is the main leverage it has in the international organizations”, says Novaković and adds that due to the same issue, Serbia is not aligning with the CFSP declarations related to China, but also some other states from Asia and Africa, who supported Serbia in the international forums. When it comes to North Macedonia, Simonida Kacarska, Director of European Policy Institute in Skopje, says that the solution of the Macedonian name issue and shift of foreign policy of the new government led to the increased alignment. “The foreign policy seemed to head Eastward, despite the official adhesion to the long declared EU and NATO foreign policy goals. EU and NATO perspectives had been trapped in the blockade by Greece and the misuse of this issue by the previous Government for domestic political purposes”, explains Kacarska. Kacarska says that the new Government addressed the name issue in the frame of EU and NATO accession, clearly demonstrating it as its top priority. 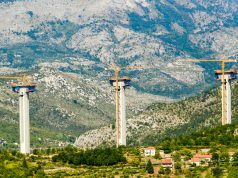 This also had an impact on foreign policy in general and has led to increased alignment with EU CFSP positions, while taking also a cautious approach not to disrupt the international acceptance of the Prespa Agreement. While the big part of North Macedonia’s progress in this field is due to the resolution the name issue, on the other hand, Novaković thinks that Serbia can improve the percentage in smaller steps even without the resolution of the Kosovo issue. “It depends to a large extent to dynamics in the negotiations between Kosovo and Serbia. But also, this is a complex process, and I think that Serbia should get the screening report for Chapter 31 as soon as possible. It would bring the issue closer to the public eye and we would have a complete set of what it has to be done. Therefore, Serbia could improve alignment in smaller but progressive steps, even without the Kosovo issue being immediately closed”, concludes Novaković.